Come and enjoy Kiruna's most popular lounge, best-known restaurant and relaxation suite with spectacular views of Kebnekaise. Just outside our door lies a world of adventure with unspoiled wilderness or perhaps even a show of Northern Lights. Relax in our sauna and dine in our restaurant, Mommas Steakhouse, at hotel Scandic Ferrum. We also offer a kids' menu for the little ones. We have ample opportunities at our hotel to arrange events or conferences for up to 135 people. When you stay with us you also have access to wireless internet access. Kiruna's sights are right on your doorstep when you stay at Scandic Ferrum. Go skiing, hiking or shopping in Kiruna's central areas. Take the opportunity to experience a snowmobile ride in Jukkasjarvi and visit the ICEHOTEL. There's so much to see and do when you stay at hotel Scandic Ferrum. Breathe in Norrland's fresh air to the sounds of a troubadour or DJ, and enjoy authentic dishes from Norrland, spiced up by the spectacular view of Mount Kebnekaise . Our lounge is your home from home, where you can enjoy a delicious drink and challenge your friends to a game of billiards. 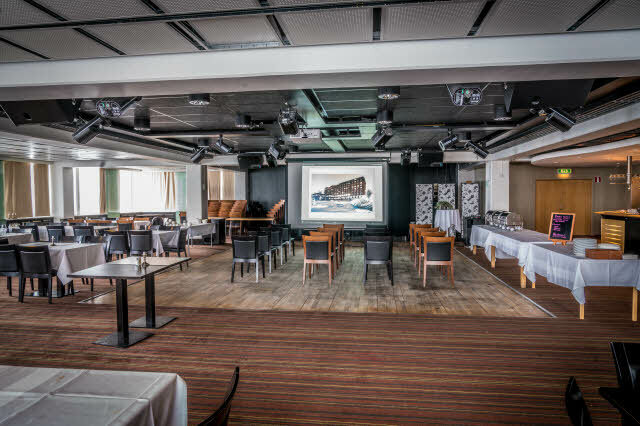 Lapland's Scandic Ferrum in central Kiruna offers 7 flexible conference rooms for conferences, meetings and events of up to 135 people. For larger events such as trade fairs or conventions of up to 400 people, we work in partnership with Kongresscentrum convention centre, which is connected to our hotel.